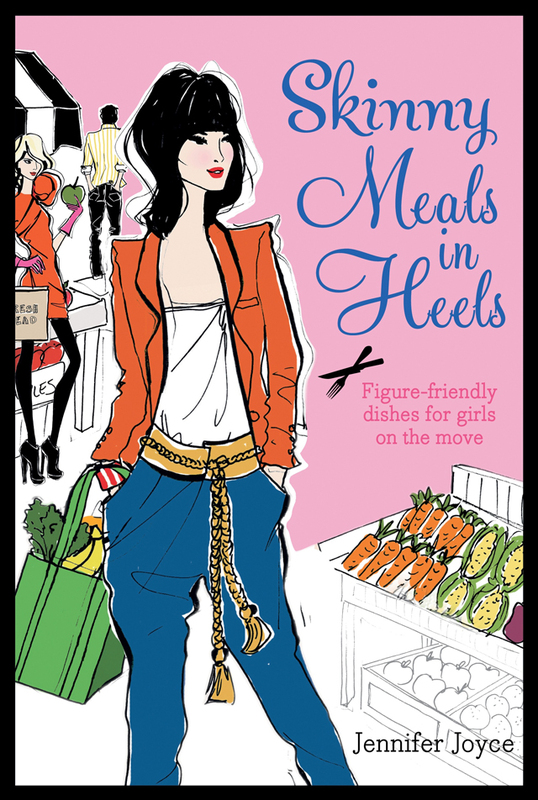 Its been a fantastic start to the year for me as it was my birthday and my new book, Skinny Meals in Heels, has been published. My previous title with Murdoch, Meals in Heels, was all about make-ahead cooking for entertaining, Skinny, is for the rest of the week. You won’t find any calorie or fat counts because its NOT a diet book. Picture instead a collection of quick mouth-watering recipes that ‘happen’ to be low in fat. Its all about ‘healthy meets delicious’ with aromatic herbs, spice pastes and chilis to flavour dishes instead of butter or cream. You still use tasty ingredients like bacon, cheese or nuts, but in much smaller amounts, keeping taste high and fat low. Nearly all of the 130 recipes can be made in 30 minutes and some under an hour, so its fast and simple. The recipes vary from making your own skinny snacks like oven-dried root vegetable crisps to comforting dishes like pork scallopine with lemon-wine sauce. Sweets are there too, with details of how to make zero fat frozen yogurt or cocoa meringue kisses. One thing is for sure, you won’t feel deprived. Like the previous book, it has all of the gorgeous illustrations of Megan Hess (stylish inspriation) plus 8 lovely photographs shot by Maja Smend. I tested all of the dishes twice and Murdoch’s test kitchen a third so so you can trust the outcome even if its something you’re not familiar with. I’m very excited and proud and hope you love it too! I’ve included a recipe and photo from the book to say thank’s for all your support and kind feedback over the years. Olive magazine’s February issue has a 5-page photographed feature from the book. Its a glam Asian menu including tuna and yuzu sashimi, sizzling Korean beef, and pineapple and mint granita. I’m in it too! BBC Good Food January issue features my ‘Make it tonight’ recipes from the cupboard. Tesco Real Food January/February includes my Valentines menu for two including roasted pear salad, seared duck with oranges, and panna cotta. Divertimenti has their spring schedule out so have a look at some of my classes including one on ‘skinny comfort food.’ Click on Divertimenti to see details. I’m teaching 3 new day-classes at Leith’s school of food including skinny food and Vietnamese. Click on Leith’s to see details. Its good to be able to reach into your cupboard and pull out enough ingredients to make soup and this is one of them. Although in a perfect world I’d like to soak my own beans, I often don’t have the time. 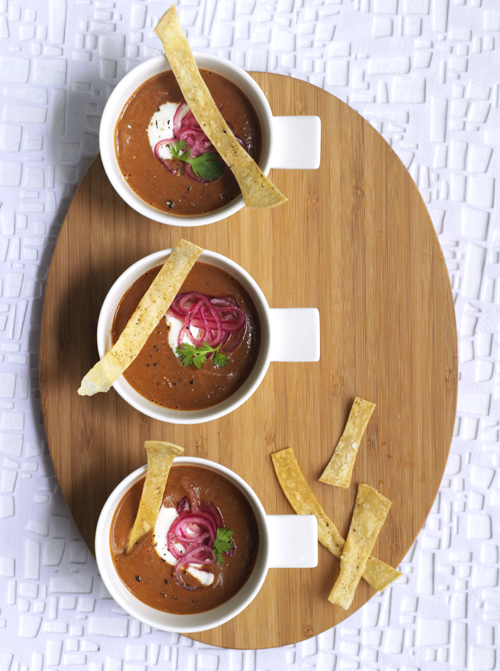 Tinned work great and soak up all the aromatic spices and tart lime-marinated onions that top it off. If you own a mandoline, try and use it for the pickled onions, which slices them paper-thin. In a small bowl, squeeze the 4 limes, one third of the onions and some salt and pepper. Set aside the rest for the soup. Leave to sit while you make the soup. In a medium pot, heat the oil over medium high heat Add the onion and garlic with some seasoning. Saute for 8 minutes on medium heat until transluscent. Sprinkle the spices in, cook for a minute and then add the beans, stock and remaining lime juice. Simmer for 15 minutes and then puree. Pour everything back into a clean pot and serve with the drained pickled onions. Serve with fresh coriander and a green salad. PREP AHEAD: Can be made 2 days ahead but don’t make the onions until the day of serving. Freezes well. THE SKINNY: Beans are immensely healthy and do ‘stick to your ribs’ keeping hunger pangs at bay. 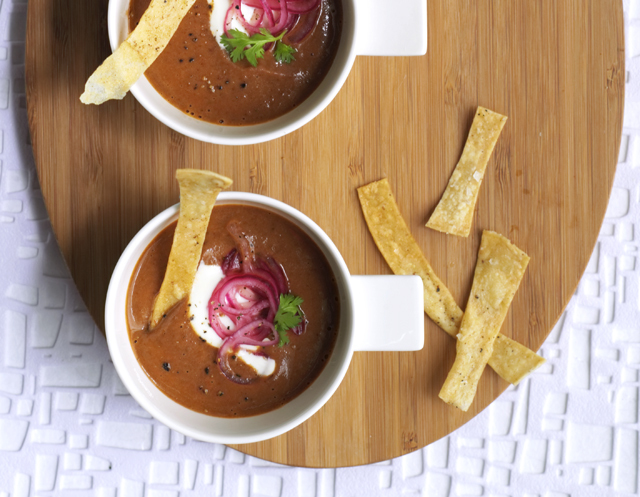 When paired with smoky chilis and lime they transform into gorgeous soups and stews. This soup sounds absolutely fantastic! Love this recipe. Happy Belated Birthday and Congrats on your book being published! Ooh. This is my kind of soup. I’ve been look for something new to try for these cold months and this seems perfect. I can’t believe I’ve never thought of anything like this. Wow! This looks fabulous. I am making it right now! This looks like such a great book! Congratulations! Although I wish there were more photos of the food I thought this is a really lovely book with loads of interesting recipes which don’t appear to be diet food at all! Thanks Michelle I hope you enjoy it! I love the book – do you know approximate calorie counts of main courses?